Initiative 427 has been approved to be on the November ballot! Thanks to all the OTOC volunteers that gathered over 3,500 signatures in the summer during the ballot initiative. The work isn’t over yet! We still need your help for voter turnout and voter support for initiative 427 that would expand Medicaid in Nebraska. Make phone calls to encourage sympathetic voters to return their early ballot, put out a yard sign and invite them to volunteer. If you would prefer to call from your home, the ITGL office staff will help you be able to do that. Canvass a neighborhood to visit homes of sympathetic voters, alone or with a buddy, encouraging a vote FOR Initiative 427, Medicaid Expansion. If you want to walk your neighborhood, we can help you with a list of your neighbors who are registered to vote. There are also letter writing opportunities. We can get Medicaid Expansion into law on November 6! Thank you for giving this request your thoughtful consideration. Working together with Insure the Good Life, the OTOC Medicaid Expansion team has been hard at work collecting signatures to get Medicaid Expansion on the ballot in November. Should the measure get on the ballot and be approved by Nebraska voters, this would serve to expand Medicaid coverage to 90,000 working Nebraskans who currently do not qualify for the program because their income is too high while also having incomes that are too low to qualify for healthcare subsidies. In essence they are in a “coverage gap.” This ballot initiative would propose an expansion law to the ballot in November, and supporters need to gather 85,000 signatures by July 6. There is not only a moral obligation to this issue, but fiscal benefits of expansion as well. “Study after study shows that we wasted dollars delaying until it is often too late for diseases like cancer, diabetes, drug addictions, mental health, high blood pressure and heart ailments. Diseases that could have been prevented at a fraction of the cost, if folks had access to early preventative treatments.” Nebraska is currently spending $34 million of the State General Fund for state disability programs, drug programs for HIV and AID’s patients, prison health and behavioral health programs. Even if Nebraska chooses to direct the full 10% of its share on expansion $22.3 million, the federal government picks up all the other costs for those programs, as well as the other cost of Medicaid expansion in the rest of the state. Moreover, the $34 million is replaced by the $22.3 million nearly reducing state spending by $12 million a year. Thirty four states have already approved this legislation. Maine is the most recent conservative state to approve Medicaid expansion, and they did this over the objection of their Governor, by ballot initiative. For years the Medicaid Expansion team has been working on passing legislation at the state level that would allow for the state of Nebraska to take advantage of federal subsidies that would expand the Medicaid program. Despite being successful in pushing for the passage of legislation multiple times within the Unicameral, the threat of a veto from the current as well as past governors has caused this process to stall. 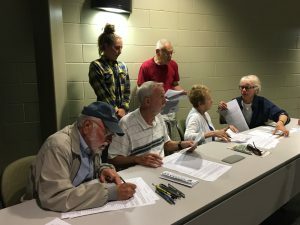 Along with signature collections, the Medicaid Expansion team has been working to inform local congregations of the Medicaid Expansion initiative and also train others to collect signatures themselves. 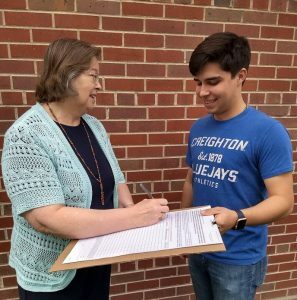 Through these distributed efforts, the Medicaid Expansion team has developed a substantial list of OTOC volunteers working to collect signatures for this initiative. As one of the largest coordinated group of volunteers in the state working on this issue, OTOC leaders stand to play a large role in ensuring this measure gets on the ballot and “insuring” the good life for all Nebraskans. Visit Insure the Good Life site to learn more about statewide efforts. Now its Up to You! On May 31st at Creighton Preparatory School Omaha Together One Community leaders and members of the Omaha community gather to discuss Medicaid expansion in Nebraska. The meeting began with an exceptional presentation from OTOC Medicaid Expansion Action Team leaders Mary Spurgeon and Carol LaCroix M.D. 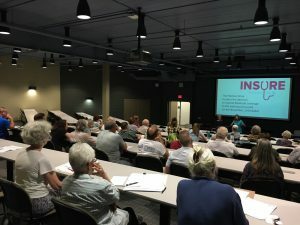 The presentation surrounded the ideas behind why Nebraskans should be in support of expanding Medicaid and the ballot initiative movement throughout the state. This ballot initiative would propose an expansion law to the ballot in November, and supporters need to gather 85,000 signatures by July 6. Approximately 40 individuals gathered at Creighton Preparatory School to dialogue about expanding Medicaid in Nebraska.